When I taught first and second grade, I always began writers’ workshop with a poetry unit. I found that this was something all my students could do – from those who were just learning to form words, to those who could write page after page. 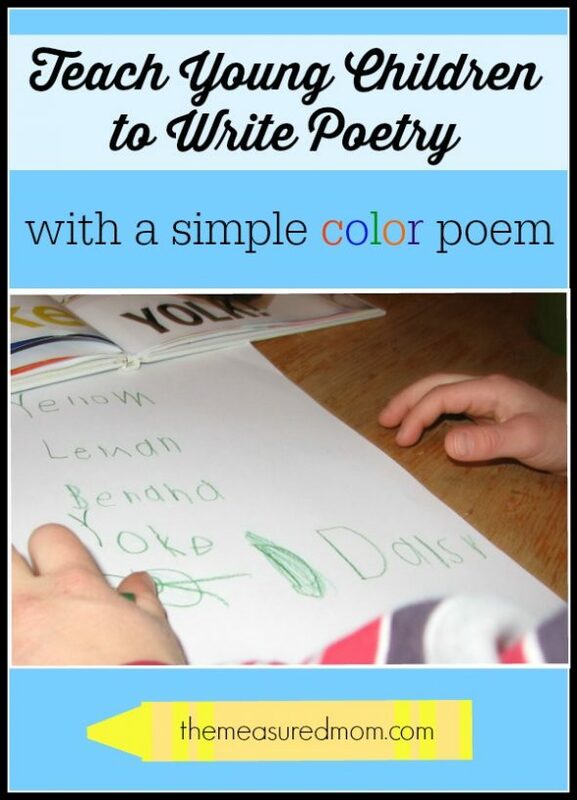 Read on to learn how to teach children to write poetry with a simple color poem. When I introduce poetry writing, I explain that poetry is different than story writing. It looks different on a page. It usually has fewer words. Poetry uses words that put special pictures in our minds. And while it sometimes rhymes, it often doesn’t. Writing poems can be intimidating for kids. Color poems show just how simple and enjoyable poetry writing can be. Yesterday, after picking up my daughter from first grade, I sat at the table with my daughter (age six) and her brother (age five). 1. To begin, we read books about color. We enjoyed And to Name But Just a Few – Red, Yellow, Green and Blue the most. Other fun color books include Red Is a Dragon: A Book of Colors, My Many Colored Days, and The Day the Crayons Quit. 2. After reading, I told the kids that we were each going to write poems about a particular color. I chose the color purple because I didn’t want to use up one of the easy colors! Be sure to model a color your kids aren’t going to choose… otherwise you may end up with two poems remarkably similar ;). 3. I wrote “purple” on top of the page, and together we brainstormed things that are purple. When I did this in the classroom, I always had to encourage kids not to just put things they saw sitting around the room – otherwise the poem might be something like this: “Chair. Scrap of paper. My shoelace. That chart on the wall.” That’s why reading those picture books first is so important. 5. Now it was time to give my kids a try at writing a simple poem. They chose their favorite colors (of course). My Six got to work writing a long list. She found the books extremely helpful as she wrote. They also helped her with spelling if she needed it. My Five (not yet in kindergarten) also got to work. The immediate challenge for him was accepting that I was not going to give him the spelling for every word. Sounding out words and writing the sounds as you hear them is part of the learning process for young writers. I was relieved that after initially crying about it, he was ready to write. 6. Finally, I worked together with the kids to help them add extra words to make their poems interesting. 7. I typed the poems up for the kids, and they both loved having a crisp, clear copy. How can you extend this lesson? a. Turn it into an art project. Have your child make a color collage and glue the poem on the center. 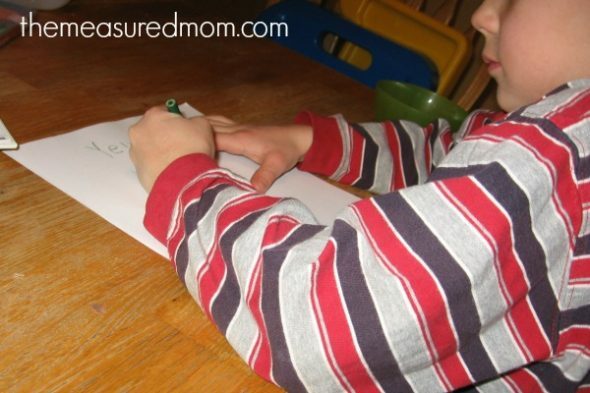 Or your child can do as my Five did — illustrate the poem and glue it to a matching piece of construction paper. b. Come back to the poem a different day and make it even better. Are you looking for more ideas for teaching writing? 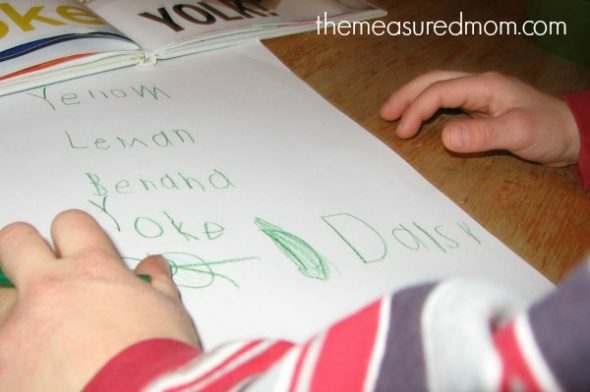 Follow The Measured Mom’s board Teaching Kids to Write Well on Pinterest. Great post, Anna! I love Tip #2 of using an example your child is *not* going to use when it is their turn to write a poem. I always chose something my son would pick thinking it would help him understand better, but then he would have trouble coming up with more descriptive words. You would have thought I’d figure that out! Thanks!! 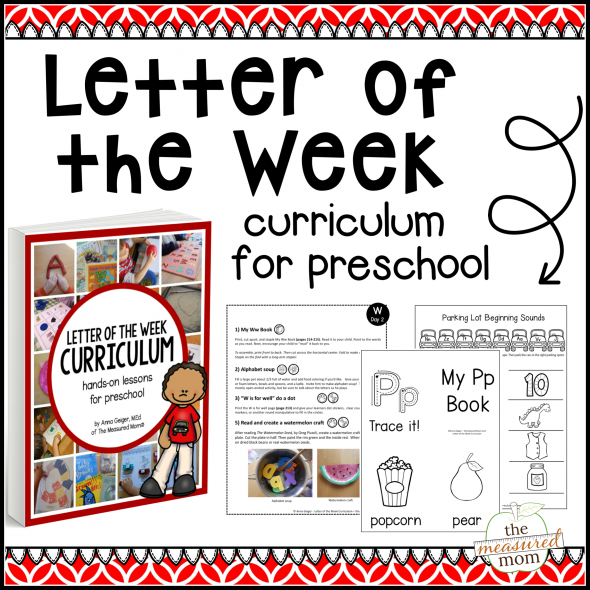 Yeah – it can be tricky choosing a topic your child WON’T choose that’s still relevant to him. Thanks for reading! Thanks for the great idea totally pinning this. My kids love colors too. Thanks for the pin, Kathy! Love this post Anna! I enjoyed teaching about color poems when I taught too! It is such a simple, fun introduction to poetry. I have a feeling my six-year-old daughter will choose the color purple or pink when she works on her color poem. This is a great way for us to review adjectives. I look forward to reading her poem. I told her about the contest and she seemed interested. That’s great, Tracey – I hope she enters! I love this idea! Even my 3 year old could write a color poem — with help from me! I really appreciate the thoughtfulness and detail of the lesson idea you shared. I love poetry and have taught poetry appreciation and writing to children all of my teaching career. Currently I am teaching kindergarten and this is a super idea I can use! We will start with some group collaborative poems, and hopefully move on to some individual poems. I’d love to have my students enter your contest! We’d love to have them enter, Frances! Anna, I *love* this! 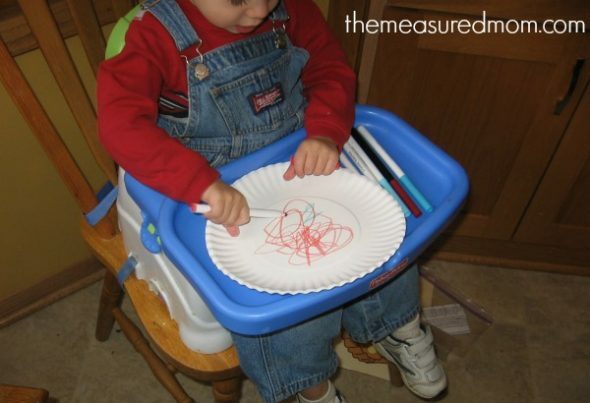 I used your method here with my kids (and my daycare kids…3 – 7 years old! ), and they all finished with wonderful poems! Thank you so much for sharing!! I like how you go into detail of how to read, brainstorm, then elaborate with more words. Great lesson! Bummer about the spelling gene ;). My dad is an amazing speller, and my mom – while a great writer – is the opposite. Thankfully I got the spelling gene — however, mom mom’s amazing artistic abilities soared right over me! Love the poems they wrote! Great activity! This is terrific! We should definitely try a color poem here! Thanks for being a poetry celebration co-host! cactus, mold and mildew and old copper metal. Love the idea of a poetry tea time. My new 2nd grader is a struggling reader, but she loves poetry and after a really positive experience at school where she got to read her poem over the intercom poetry writing is something she’ll actually do. I love this detailed explanation Anna. Thank you. And Julie, I’m intrigued by poetry tea time. Would love to know more. 🙂 I hope you get a chance to try this lesson! Came across this post today and want to say thankyou for such a great idea . We tried this today and this is what my 5 (.will turn 5 at the end of Nov . ) year old came up with . Love your ideas. I use Hailstones and Halibut Bones for the color poems. I love that book! I remember using it when I taught in the classroom.